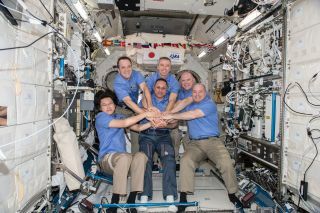 The six-member Expedition 55 crew poses for a portrait in the Japanese Kibo laboratory module of the International Space Station. Clockwise from left are flight nngineers Norishige Kanai, Ricky Arnold, Drew Feustel, Oleg Artemyev and Scott Tingle. In the center is Expedition 55 Commander Anton Shkaplerov. Three spaceflyers are returning to Earth early Sunday morning (June 3), and you can watch their homecoming live. Coverage starts at 1:30 a.m. EDT (0530 GMT), when NASA astronaut Scott Tingle, cosmonaut Anton Shkaplerov and Norishige Kanai of Japan say goodbye to their fellow International Space Station (ISS) crewmembers and board a Russian Soyuz spacecraft for the trip back to terra firma. You can watch this farewell, and all the action to follow, live at Space.com, courtesy of NASA TV. Hatches between the ISS and the Soyuz are scheduled to close at 1:55 a.m. EDT (0555 GMT). If all goes according to plan, the Soyuz will depart at 5:16 a.m. EDT (0916 GMT), perform a deorbit burn at 7:47 a.m. EDT (1147 GMT) and touch down on the steppes of Kazakhstan at 8:40 a.m. EDT (1240 GMT), NASA officials said. Undocking coverage will begin at 4:45 a.m. EDT (0845 GMT), and landing coverage will start about 30 minutes before the deorbit burn, at 7:15 a.m. EDT (1115 GMT). Tingle, Shkaplerov and Kanai were part of the ISS' Expedition 55 mission, which will officially end when the trio's Soyuz undocks. Shkaplerov already handed the keys to the orbiting lab over to NASA astronaut Drew Feustel, during a ceremony on Friday (June 1). Feustel will command the new Expedition 56. The three homecoming spaceflyers are wrapping up a 168-day orbital mission that featured 2,688 laps around Earth, which covered a total of 71.2 million miles (114.6 million kilometers), NASA officials said. The departure of Tingle, Shkaplerov and Kanai will leave the ISS with just three residents — Feustel, fellow NASA astronaut Ricky Arnold and cosmonaut Oleg Artemyev. But this skeleton crew will soon have company: A Soyuz spacecraft carrying cosmonaut Sergey Prokopyev, NASA astronaut Serena Auñón-Chancellor and the European Space Agency's Alexander Gerst is scheduled to launch atop a Russian Soyuz rocket from Baikonur Cosmodrome in Kazakhstan early Wednesday (June 6). If all goes according to plan, the newcomers will arrive at the ISS on Friday morning (June 8).